I've always wanted to go zorbing in the hills of Rotorua in New Zealand - it's right up there with skydiving, learning French, and writing a book, on my list of lifetime goals. 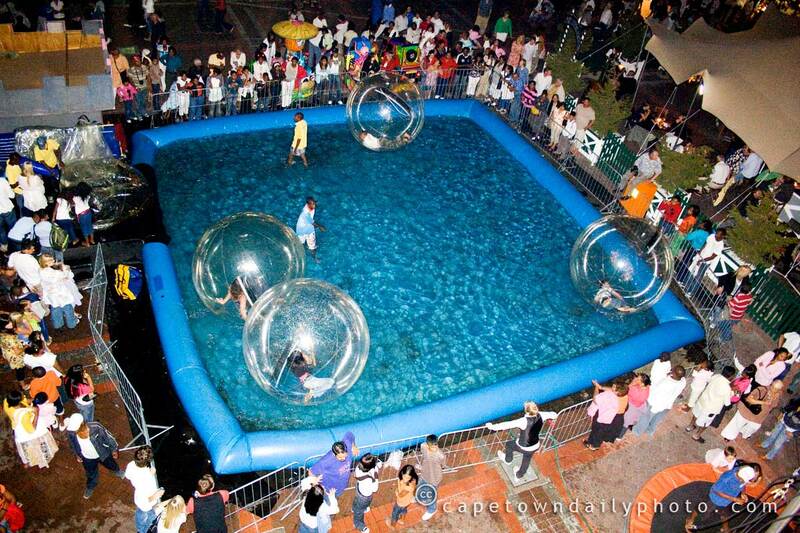 I was tempted to try this mini-version of zorbing at the V&A Waterfront on New Year's Eve, but I suspect it wouldn't have been quite as much fun as the real thing. The kids that were playing in these giant plastic balls seemed to be having a pretty good time though, rolling and tumbling along on the surface of the water. Have you ever been zorbing? Is it as much fun as I think it would be? Posted in Street photography on Saturday, 3 January, 2009 by Kerry-Anne. zorbing! what a fantastic idea. Great picture. I WANT THIS AND IM GETTING IT FOR FAMILY FUN DAY!!!!!!!!!!!!!!!!!!!!!!!!!!!!!!!!!!!!!!!!!!!!!!! !